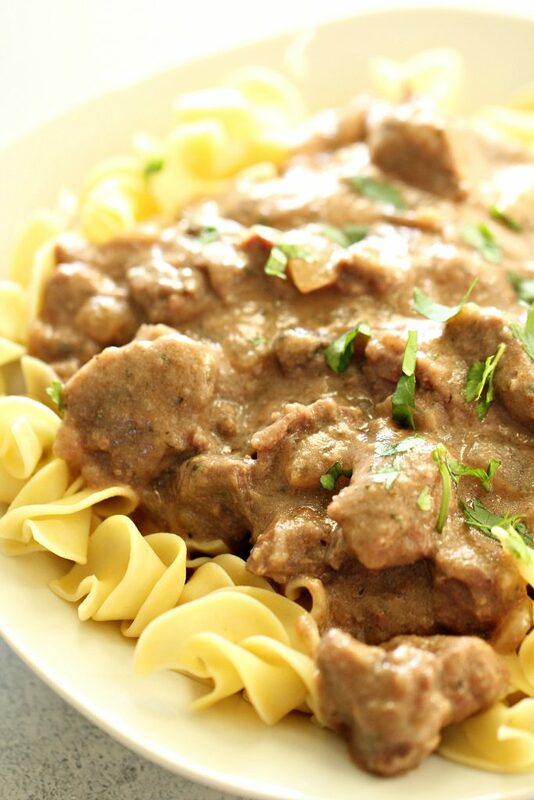 The only time I made beef stroganoff, I used a can of cream of mushroom soup to make it creamy . . . but my family wasn’t crazy about it. I knew that there had to be a healthier and yummier way and this recipe was born! 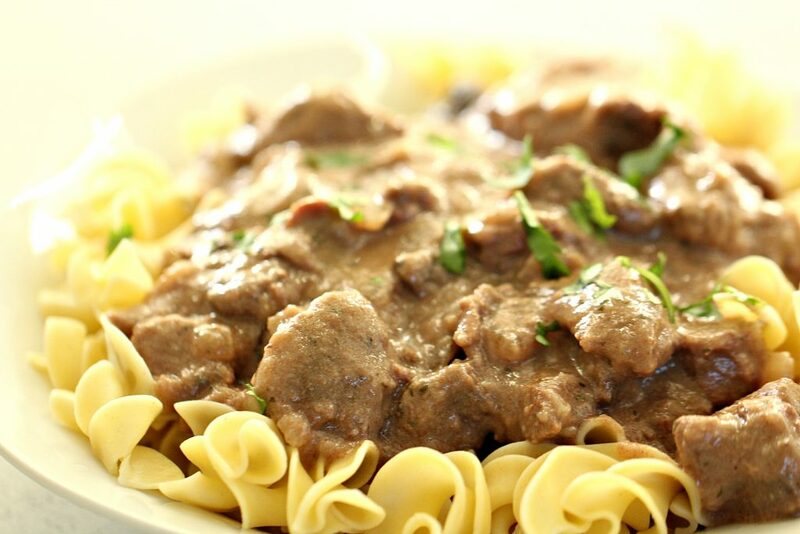 The secret to a healthy, creamy beef stroganoff?? Now, hear me out . . . I don’t really like cauliflower, but when it’s slow cooked with other ingredients, it usually takes on their flavor – so you steam the cauliflower, blend it up smooth, and pour it in to the slow cooker. It cooks all day with the meat and other flavors and soon just gives you a nice, creamy gravy to go with your beef. Healthy? Check. Delicious? Double check! This recipe really turned out awesome. If you are looking for more healthy recipes, be sure to check out our Healthy Eating Bundle with hundreds of healthy recipes that are family approved! Steam cauliflower as directed until cauliflower is completely soft. Place cauliflower in a high-speed blender (you can add a little water if you want) and blend until completely smooth. Set aside. Spray slow cooker with non-stick cooking spray. Place beef stew cubes in the bottom of the slow cooker. Top with mushrooms, onion, and garlic and add salt and pepper to taste. In a large bowl, mix together blended cauliflower, beef broth, whole wheat flour, ketchup, Worcestershire sauce, mustard, parsley, paprika, and oregano. Pour into a saucepan and bring to a boil on the stovetop over medium heat and cook until the mixture thickens up to the consistency of gravy (it's okay if it's thick - it will thin out as it cooks). Pour gravy into the slow cooker and cook on high for 3-5 hours or low for 7-9 hours (or until the meat is fall-apart tender). Once it is done, mix in sour cream and serve over cooked egg noodles.